In medium bowl, combine cornstarch and 1/4 cup of the coconut milk; mix until smooth. Stir in remaining coconut milk and all remaining sauce ingredients; mix well. Set aside. Meanwhile, heat oil in large nonstick skillet over medium-high heat until hot. Add sugar snap peas and carrots; cook and stir 3 minutes. 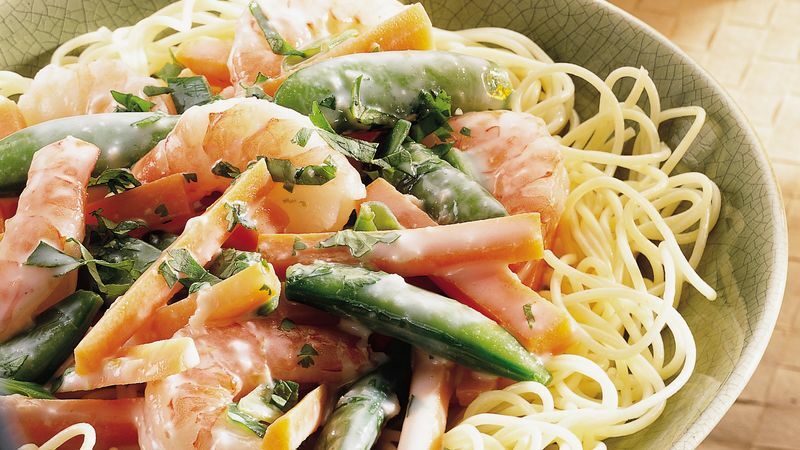 Add shrimp and green onions; cook and stir 3 to 4 minutes or until shrimp turn pink and vegetables are crisp-tender. Add sauce to skillet. Bring to a boil, stirring constantly. Boil 1 minute, stirring constantly. Serve shrimp mixture over pasta. Sprinkle with cilantro.